Which topics to start for CEED exam? My sketching level is below average, how to improve before the exam? Which part of the sketching should I start? What to skip (what not to practice)? How to schedule my time every day? These are the questions that might be confusing you. Well, don't fear. In this post I'm gonna cover all of the above questions giving necessary suggestions from my end for your smooth flow of practice. Remember one thing, there is nothing like zero level of sketching because it's a fact that everybody has got some design talents hidden inside them, and even if one thinks that the so-called zero level exists, then let me tell you one thing, such people can definitely improve their design talents with proper practice and most importantly with their self-confidence and passion towards design ! You may also watch the video of this tutorial at the end of this section. The above four stages represents the complete process of CEED exam. Well, here comes the main content of this post. It's always better to start with basic sketching work. Most of you start with object sketching giving utmost care to shading and detailing. According to me, jumping straightly to the concept of detailing is not a good idea. To reach the top floor by taking say 10 steps, one has to start from the first step. Same funda applies to your sketch practice. 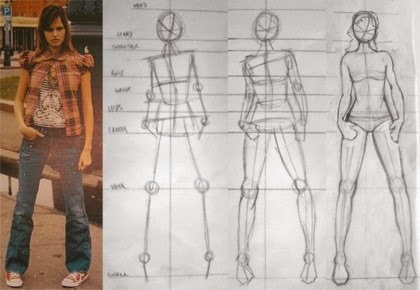 Instead of jumping straight to the final stage of sketching, begin with the basic fundamental steps. Remember; it's no use if you apply a mind blowing shadings or detailing for a proportion-less image ! Likewise there won't be much problem if you care less for shading with very good proportion of the image. Proportion here means, the size of the picture comparative to the surroundings. I had seen many students doing the mistake of not caring for the size of the picture. Below shows a sketch from one of my friend that supports what I'm saying. As you can see, the books on the desk appear more bigger than the rest of the objects, which in reality is not practical, right ? I can say the shading that has been given to that picture were in no use as the total picture went wrong. Now, I hope you understood the importance of size and proportions concept. So, better start practicing with simple line drawing - simple sketching minding the reality of the sketch, in other words actual proportions without much concern on detailing, clear ? Don't forget to practice the methods of sketching with different degrees of fineness - thickness and sharpness of lines wherever required. Try to learn : 'how to use different grade pencils' (viz. 2H, 2B, 4B grades), sometime after you start your initial practice. That will ease your sketching later ! Let's see what to do with GA (general awareness) study. Remember that, even when you go through awareness questions right from now, you need to revise the same before the exam as it is more or less like a theory subject. If you don't have related resources, then you should be caring about data collection, but most of the topics were covered in this blog and interestingly as you move on, you would notice that discussions on GA and cultural aspects will be carried in Facebook groups, forums as well as in some blogs. So, it's always advisable to skip your GA practice from the very beginning. Instead, schedule your GA study - may be before 45 days or (in most cases) before a month. That should work and of course it worked for many ! It's clear that preparation for interview could be carried after the declaration of results. So, you should not care about that until CEED exam. Next comes Portfolio generation. You will be getting more than two months time between the exam and the interview date. I can say, that time is more than enough for anybody to work on portfolio. While I recommend you to save all your practice exercises (that could be sketches, designs or any other creative exercises) for future use. Your practice works might ease you as well as aid you with your portfolio preparation. A combination of your practice works would provide you some bunch of ideas ! The left discussion is about Design thinking and creative idea generation. These topics really require considerable time to improve and we cannot develop design thinking skills overnight. 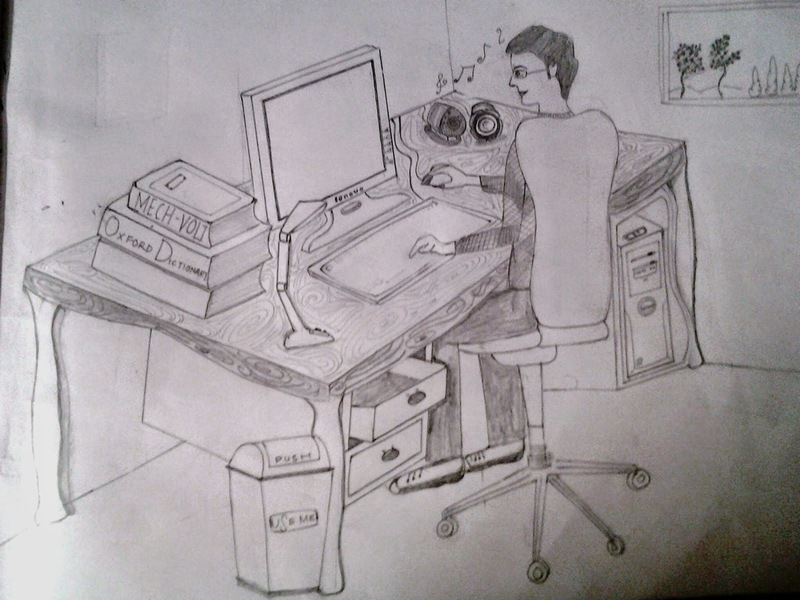 So, you need to parallelly start your preparation for design and creative thinking along with your sketch practice. The current design - why it is so ? What are the problems with that existing design ? What changes can be made in that ? What more can be included in the design ? Any drawbacks of the new design ? The list goes on. It's up to you - to think laterally on any selected product. For example, you may consider say your own wristwatch and analyze it for the above points. Make a note of the ideas and if possible put your imaginative thoughts in paper (simple rough sketches). Like this, you are advised to make every day; a design analysis for day-to-day regular surrounding things - whatever things that strikes your mind or that appears to your eyes. Remember, It's very easy for you to find faults in others work than faults in self-work, same goes with others. Others (friends, instructors, family or even children !) are good judges for your work. They may give you appropriate suggestions, changes or any other additional to be made in your's. Most of the time, we learn from the mistakes and there's no harm in making mistakes even if you are doing mistakes in every assignment ! By understanding 'WHAT NOT TO BE DONE' in every exercise, you are upgrading yourself and it is the true knowledge that will stay with you forever. So, I advise you to share any of your design works with your friends or especially so called groups (Facebook groups and forums) and get feedback from others. Your work will inspire others to start their own and of course your ideas will be a lesson to group-mates. Likewise you need to analyze the mistakes in others designs/sketches too. You might also learn others ideas; so that the process would assume two way - with gain to both ! Don't make others fear with your outstanding artistic works. If you are an artist, then save your mind blowing works with yourself. The thing is if you post such kind of hi-fi works in groups, then others might get misguided, they assume falsely that the standard for CEED would be to that hi-fi level and so they may lose their confidence. I had seen many people getting disappointed as they are not catching up with that level of works. CEED exams are designed to test mostly your design ability and sketching work matters next. Even one who is below average in sketching gets good score in the exam. I'm the best example for this case. So, what I want to say is, just share or post design/sketch works, the level of which is sufficient enough to meet CEED standard. Show your artistic skills after getting seat in M.Des ! Well, I had included a number of everyday design thinking as well as practice exercises in this blog. You may take an exercise everyday and try to solve it as per the question. I will be giving my suggestions and answers to that questions in the coming days, so that you may cross check your's. Analyse others works and give suggestions from your end in-order to self-improve ! These are the 15 points that I wished to bring before you - for your smooth CEED practice. Hope this helps you. Feel free to comment below regarding your views or suggestions about this articles. All the best with your start ! Thank you so much..i think this is very systematic approach towards CEED preparation. 4. Try to sketch the memorized images by own imagination roughly. Great blog, very helpful. I just wanted to ask a questions though. How do we know what areas are we good at and what we need to improve related to CEED course? Can I mail you my other doubts? I have lot of them. It would be great if you could help me out a bit. Okay, the best way to get to know where you are good at and what you need to improve is by going through previous question papers. Try to give solution to the CEED previous papers (especially CEED 2012-14 papers, design part), that would help you understand - where you need to improve and in what you are good at. Yes, you may mail me your doubts, although I always prefer to receive queries by way of blog comments. Clearing doubts through mails will only you, but clearing your doubts through this comments will be helping many ! Can you give us any resources to start with Sketching exercises? Anyway, I have plans on making a video on guiding 'How to learn sketching step by step for CEED exam' - giving utmost details for easy understanding. I will be working on it very soon. It really doesn't matter whether you are a civil/mechanical or any other branch graduate, Whenever someone starts a design course, it's just like fresh start, starting from scratch - may be you will taught right from the basics of the subject ! 1. Why I'm looking for design - just for some career or passion ? 2. What is my interest rate ? 3. Don't I have opportunities in Civil engineering ? 4. What is my level of design thinking and do I have interest in sketching ? 5. What particular design stream suits me ? Answer these question, and you yourself would come to know whether design is suited or not. Here is a broad definition and comparison of Design for engineers and ordinary design - Design in Engineering and aesthetic context. Is that suits you ? thank you very much for this article...it will be really helpful for those who are preparing for CEED...and one more thing are there any good reference books for preparing CEED ? and also any good institutions for coaching ? actually coaching is it necessary..? I had a query regarding CEED and it would be great to get your response on it. How does the negative marking work in CEED and what is the number of questions we need to get right in PART A to qualify(approx) . And also what is the qualifying rank for the design schools. Certain sections have negative marking while some sections don't have them. You may check this official CEED brochure to get more details about negative marking. Also there is no number count of how many questions to attempt. It depends on how many questions you attempted, and out of which which is correct and which is wrong. CEED cutoff is usually greater than 20. So, based on this, you may go accordingly. AIR below 700 are good enough to get into any of top desig institutes. When are we supposed to make portfolio? And shd they be made? How and when is one supposed to make their portfolio? When are we required to choose the course(Product Design/Animation etc) offered ? It is not asked while filling up the online form? CEED is a common exam and is not design specific. So, your application will not ask your choice of stream as of now. BUt once you clear the exam, and when you apply for institutes separately, then the institutes ask you about choice of streams and their preferences. Only at that time (and of course during interview) you need to specify your stream choice. So, just go ahead and prepare for exam. hi:) im an instrumentation engineer. and confused between taking up a job and pursuing a masters degree in designing..probably in industrial designing coz that would keep me linked to my field. but what would be the job oppurtunities after pursuing the masters degree in designing. also im confused as to which field in designing should be chosen keeping in my that im an engineer. I suspect that design in mdes sense is mostly related to products in public sense and yes of course in industrial sense too, but instrumentation filed is bit different and I don't think, mdes covers this area. Job opportunities will be like developing products for companies that are mostly user based like I mentioned earlier. Industrial needs are met but again I doubt instrumentation is covered or not. You may do one thing, go through the Industrial design course module and check the subjects and syllabus covered as part of the schedule. Probably tang should help u.
Hi.. i am an Electronics Engineer. I have completed senior diploma in Drawing and had a decent score in NATA exam. I am inclined towards drawing and want to pursue a career in the same. But little confused about how to make it during these 2 months of preparation. Can you suggest how to make use of the time efficiently to score well and also when will the stream selection be done? Do we have some specific preparation material? If you have read this post/page, then I think your doubt would have cleared by now. Anyway let me put again, since you're gud at sketching, you have very little work to do and 2 months time is more than sufficient for good practising. Spare couple of hours everyday and work mostly on design ideas and Part A non-GA type questions. If you're working, then also u can spend some hours weekly and cover topics with ease. Design ideas are more imp. in ceed, than object sketching, so be prepared for that. Try to cover Part A in a span of 1 month. Stream selection can be done after CEED exam - when you're applying for individual institutes (say in the month of Jan) after the results are declared. So, you don't have to worry now. helo sir this is kapil btech passout from CSE, sir this year im preparing for ceed 2016 and only one month left and im preparing for it since last 4 months so sir i got to knw about myself tht i have good in imagination but average drawing skills and speed is also average and i have very good ideas in product designing but im frm computer background so i dnt have much mechanical knowledge and i have also very good imagination in stories for human anatomy animation but not good fit for animal sketching and last i want to say im very good in communication but in my coaching i have low level in sketching. and in my coaching they dnt do much focus on part-A and on interaction design;i want to ask what should i do in this last month? im very confused right now. prepare well in topics that u r good at, Part A is very imp, so u cannot neglect, don't try to cover all design streams, practically it's not feasible, since u r from cse dept, animation, story making suits, n u also can do on PD, communication, but ur sketching skills shld not be slow, try to practice as many design ques as possible. sir is it good to use mechanical pencil for sketching in the exam ? yes, u can, but mostly prefer regular pencils over mech pencils, use mech pencils for initial rough sketching or line drawings. Anyway, it depends on your proficiency. If u r convenient with the later, go ahead. Will I be able to crack CEED 2017 if I start preparation now, I come from architecture background. hi sir, i am Monika graduated from NIFT . first of all i want to say that your blog is really very helpful ..thank you so much . start with story writing . could you please share some thing more about animation for CEED. i am really confused how to prepare for animation.. please give me some guideline how to precede. CEED is a common entrance exam and the exam will not be held on stream basis. So, u need to prepare for the exam as a general; as if u r giving a general design exam. So, preparing only for animation will not help u. You need to practice for at least two/three diff design stream related questions. Imagine a scene from a cookery show. The chef has just placed a pressure cooker on a two-burner gas stove. Draw a freehand perspective drawing of this setup. you need to draw all the elements of their listing, since they've mentioned about the chef, you should show him too. Remember they've mentioned specifically as Chef instead of a person. Hi Sir, I am CEED Aspirant. I am trying to prepare for CEED as Well as working in a company. I have been trying to manage studies with my job, but now when less than a month is left for the CEED exam and less than 2 weeks for NID exam, i am feeling nervous, as I feel I have not been able to study well till now. This is my third attempt, and I really want to clear this exam. for the last two attempts, I even quit my job, but feeling scared to do so again. Is there any way , or set strategy i could apply to prepare properly to clear this exam in less than one months time? For both the last 2 attempt, i could clear part a but not part B. BUt now that so less time is left, I feel i cant ignore any part despite of the fact i cleared part a both the times. Plz Help, feeling extremely nervous rt now. N also suggest, is it advisable to put the job n other thing aide n take some crah core or something? I appreciate your continuous effort to clear the exam. Good thing is you were able to clear Part A earlier, without much practice! Which clearly tells that you must be good at aptitude and GA skills. So you're already safe that you got time to spare for part B rather than part A. What i think is u need to generate more design ideas and work on sketching things. I'm not sure whether any crash course would help you at this time (u said two weeks left) since even if u take crash course, it's ultimately ur sketch/design practice that helps u get good score. And I'm sure you already know the sketch level required for CEED, I've already mentioned that above also. Thank you so much for all your efforts! they have been immensely helpful for CEED preparations. I've just gone through that ytd video. Appreciate your daughters interest at her early age. From the likes of the drawing that she drew as i saw in that video, I do feel that NID and NIFT are good choice for her. I usually don't suggest anyone to wait for one or more years and so I'm bit skeptical in suggesting you to let her wait for the next year. Good thing is after NIFT also, she can go for MDes (thru CEED) or NID. So, if she is left with NIFT option alone, then I would rather recommend to grab the opportunity and move ahead. Life in NIFT is also good and students do enjoy the courses. If in case, she dislikes fashioning field, she can switch to other design in the future in her PG. This is what I can suggest. Or share some more art (specifically creative or design works apart from human portraits/sketches) of her so that I can evaluate further and give any supportive choice for her career. Else, you may consider the above points. hi brother! i'm an iit aspirant but not cracked jee2017 any ho doing my B-TECH 1st year in small private engg clg . I did not searched about the other ways of getting into iit !then one of my friend placed in iit gowhati in B-DESIGNING by this CEED2017 and your guidance then i'm came to know the about the B-DESIGN i'm iterested in it. so, am i eligible to write CEED2018?.reply your suggestion please. 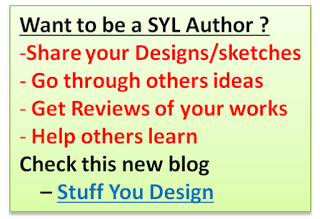 I don't see ur interest in design, ur target seem to be just IIT tag and not worried about which course u r interested ? first thing first, of u wish to do dsign (bdes or mdes), u need to have design interest n passion, not just taking coz of some other reason like IIT. Only with interest one have higher chances of excelling in design career. I am interested in Interaction Design.Thank you for uploading a few resources related to the same. Could you please help me prepare for Part B questions of CEED related to Interaction design. Hey! Thanks for the information, I'm preparing for ceed exam for Mdes in animation with the help of this Amazing blog. Hope things turn out to be positive for all of us. all i wanna ask is why are you doing this? Can you please update the topics like current affairs and general awareness for 2019 preparation or all we want to take a revision of all of this stuff?